River improvement project. Improvements made to river as part of Fishing is Fun program project. Division of Wildlife. Ben Swigle. Photo taken: 9/1/2011. Mountain Park Environmental Center is offering a slew of youth environmental camps throughout the spring and summer. Read into the options and details HERE! MARCH 21st, 2018: The Alliance for Water Efficiency and Environmental Law Institute have updated the 2012 State Scorecard. The 2017 version is based on a very similar, but much expanded, survey as was used for the 2012 State Scorecard. This not-to-be-missed webinar will address changes in state-level laws pertaining to efficiency and conservation. It will also cover national trends and observations from the research, state specific highlights, and perspectives from a state-level official. This is FREE! Click HERE to register. The Center for Protected Area Management at CSU, the Salazar Center for North American Conservation, and other university partners are co-hosting a special guest lecture. President Obama appointee as the head of the US National Park Service, Jon Jarvis, will talk about his new book titled, The Future of Conservation in America: a chart for rough waters. The lecture will take place on Thursday, March 22nd from 4-5pm in the North Ballroom of the Lory Student Center on CSU campus in Fort Collins. A reception with lights snacks and a cash bar will follow from 5-6pm. Click HERE for the full details. APRIL 6th, 2018: Southwest Water Conservation District presents the Annual Water Seminar. 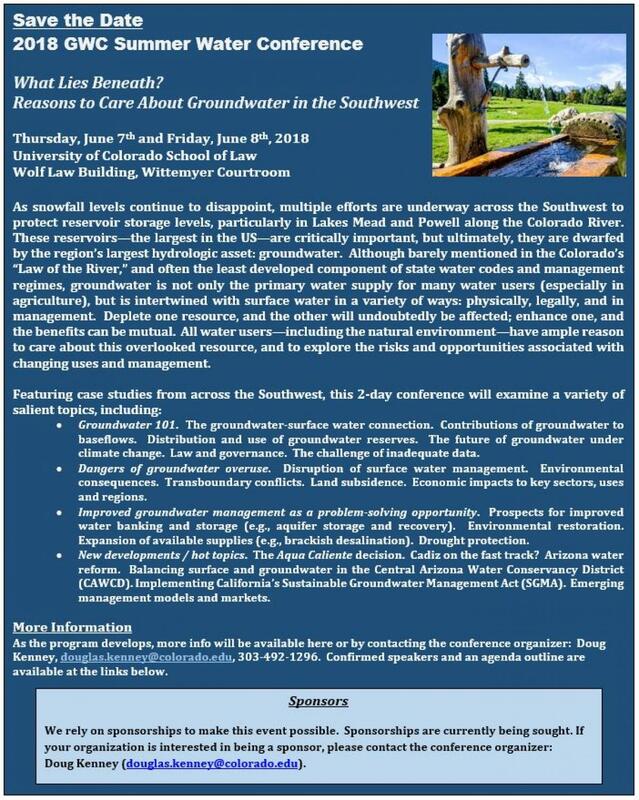 Experts will discuss just that: how wildfire impacts to water supplies, the state’s response to emergencies such as the 2013 front range flooding, the western slope’s risk in the context of Colorado River obligations and drought, as well as avoiding devastating infrastructure failure, among other related topics. The full program will be posted here shortly. Click HERE for more information and to register. APRIL 11th-12th, 2018: 24th Annual Arkansas River Basin Water Forum Program CONNECTIONS, CHALLENGES, CHOICES and CHANGES in a Junta, CO. Each year the Forum Board of Directors recruits a new host community within the Basin to help plan the Forum. This tradition ensures that the Forum broadens relationships throughout the Arkansas Basin, which is spatially the largest river basin in Colorado covering 27% of the State’s area (28,268 sq. mi.). This year this dynamic forum covers topics that include: Tackling Water Quality Problems while Keeping Agriculture Productive in the Lower Arkansas River Valley and Fire and Flooding - Not If, But When. Click HERE for links to the agenda, sponsors, and registration. Think creatively! What are you and your partners doing that will inspire others? Workshops are 75 minutes, and this year we have some 60 minutes slots available in length. Expect roughly 20-40 people in attendance per session (overall conference attendance is expected to top 300 people). Preference will be given to interactive presentations that invite dialogue, discussion, and constructive debate. Please submit your session proposal in the format described in the attached document by email with the subject line “2018 COSA Session Proposal” torob.burdine@cityoflafayette.com All proposals are due by close of business on Friday, April 20th 2018. OCTOBER 24th-25th, 2018: 29th Annual South Platte Forum at the Embassy Suites in Loveland, CO. The conference will feature an exciting lineup of speakers and topics, and a great opportunity to network. This year the South Platte Forum is accepting speaker applications! If you have a topic that you would like to present at the conference, please submit an application for the Committee to review by May 1st, 2018. Find the list of speakers and their bios HERE, and all general and pertinent information and links HERE. This year the South Platte Forum is accepting speaker applications! If you have a topic that you would like to present at the conference, please submit an application for the Committee to review by May 1st, 2018. Apply HERE!